1. Content & Engagement: We have monthly topics relevant to business, individual growth, community, or some combination of all three that is brought to us by local subject matter experts (SMEs) or other channels. We then encourage our Ambassadors to dialogue with one another, creating a space for encouragement and challenges with business peers. 2. Building Relationships: Building allies and leads is important for any business. We provide a space where you can do this on a regular or irregular basis depending on your needs. Previously known as networking. 3. Be in the Know and Take Ownership: This group gives you the opportunity to be aware of how others are dealing with challenges similar to your own, allows you to be in the know about upcoming business news & events, and often you will hear about opportunities to serve the community you work in (aka: padding your resume). 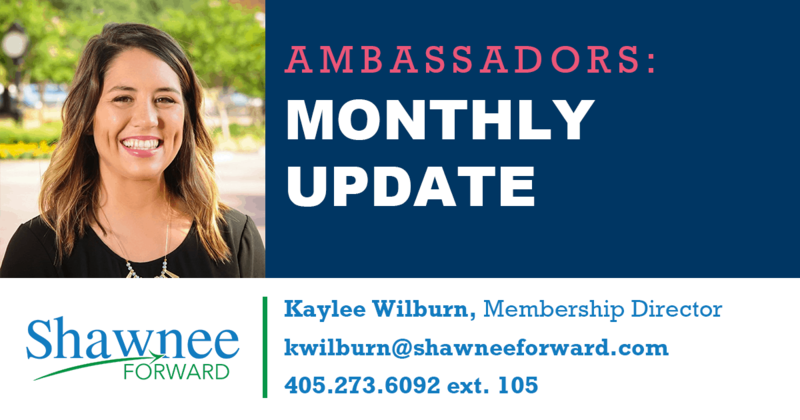 JOIN US Wednesday, February 6th at 9am for our next Ambassador Group meeting! Kathy Laster, CEO of the Avedis Foundation will be our featured subject matter expert on goal setting and motivation. Shawnee Forward Conference Room. 231 N. Bell Ave.